Opening reception Tuesday, February 24, 2015 from 6 – 8pm. Present Life, a solo exhibition of sculpture, photography, embroidery and site-specific installation by New York based British artist Zoe Buckman will be on display at New York’s Garis & Hahn Gallery. Present Life is a collection of works that explore the liminal space between life and death and cycles of genesis and decay. Buckman adds breadth to these works by capturing the nuance of natural sequences on the cusp of their transition from one state to the other—from non- existence to existence and back again–rather than focusing on the finality of their outcome. She then takes these ideas of transition further by manifesting the most private in-between state, the subconscious, in an immersive installation in the lower level of the gallery. The intention to capture intermediate phases is clear in Buckman’s photographs of week-old flower arrangements wrapped like bodies in black plastic trash bags. These works are described as “the start of the end”; the time when “the flowers are still beautiful but have begun their descent.” At first glance, the bouquets look bountiful, but the large scale of the works allows the viewer to become intimately acquainted with the markers of decay: The browning edges of an iris in Untitled 2; and the curling edges of the roses in Untitled 5. The photographs can be seen as a celebration of life and beauty, but also as a memento mori, a visceral warning of the inevitability of death and a call to cherish our limited time before it. Buckman furthers her exploration of beauty and fragility through neon light sculptures. For Buckman, using neon is akin to painting; it allows her to create broad, gestural strokes in brilliant and alluring hues. 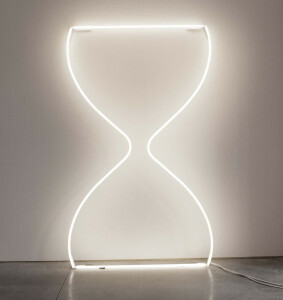 Untitled 6 is a six-foot outline of an hourglass that illuminates in pure white light, alluding to time and the shape of the female form. Untitled 7, a representational drawing of a placenta in salmon pink strikes a more playful tone. Buckman began using the placenta as symbolically significant after she gave birth to her first child in 2011 and subsequently learned that her placenta had started to deplete. In light of this revelation, she became fascinated with the duality of this organ, “it nurtures life but can just as easily extinguish it”. Buckman extends the image of the placenta in three other works. In Untitled 8, the viewer can make out the organ as an imprint on cast concrete slabs developed from photographs. The imprints map out the boundaries of the placenta, simultaneously building and deconstructing the form. In Untitled 9, the viewer is confronted with the artist’s own plastinated placenta seated in a convex marble frame. Buckman expressed how the organ had “come from the body, been turned into something bog-standard and ‘man’-made”, and how she wanted to “put it back into the earth using marble: a marker of time and a relic from our pre-history”. Newer works in the series include hand-blown sculptural hourglasses, Untitled 10, and works on heirloom lace that Buckman has embroidered with fragmented text taken from vivid dreams about mortality that she experienced during her pregnancy. These textiles add a dimension of nostalgia to her exploration of life, death, fragility and beauty. The threads of the lace connect the viewer to the intricate web of blood vessels and cells that make up the placenta, and floral patterns of the lace simplify the organic bouquets in Buckman’s series of photographs. This exploration of the artist’s dreams, the ultimate ‘in-between’ space, is elaborated in a site- specific installation on the lower level of Garis & Hahn. Upon entering, the viewer is confronted with a warm and surreal environment encompassing two floating lace garments, embroidered with fragments of her documented dreams. Using a table runner from her grandmother’s antique lace collection laid on a wooden table, the artist invites visitors to engage in her dreamscape by sitting at the table and reading text pulled from her subconscious, which she has embroidered on the length of the runner. Adorning the table are groupings of small, hand-blown glass objects representing shallots in reference to the text found on the runner. An audio track of her family’s Sunday dinner plays from one end of the table, from the other the sound of the Sea. Beneath the table, sand spills out to the chairs, as if the hourglasses in the main room of the gallery have tipped and trickled down into the subliminal layer of the exhibition. The symbol of the family table is the physical place that connects past with present, where stories from the living convene with the memory of ancestors past, and embedding the piece with the celebratory and corporal nature of a feast, be it with our mouths, eyes, or imaginations. Zoe Buckman (b.1985, Hackney, East London) lives and works in New York and is represented by Bethanie Brady. Her work has been shown in group exhibitions including New Abstraction at Leila Heller Gallery; Contemporary Spotlight: TEXT, Paddle8; the Hidden Gems Project for Christies, exhibited at The Getty Images Gallery, London, and Small Is Beautiful, a group show at Flowers Gallery in East London, and was a featured artist in Pulse Projects, New York, 2014. In Spring 2015, Buckman will be one of a handful of artists selected to participate in the Artist Residency Program at Mana Contemporary and will be included in In Your Dreams, a group exhibition curated by Marina T. Schindler at the Spring/Break Art Show, as well as Africa’s Out, a group exhibition at Barbara Gladstone Gallery, co-hosted by Wangechi Mutu to benefit Uhai Eashri, an organization with the mission to support, celebrate and protect the lives of the LGBTQI community in Africa.